But Collins cared, and he was not about to curb himself, not for the sake of his conference commissioner, who had asked him to play nice, and certainly not for the sake of Pearl — a "shyster," in the old coach's words today, one of those "he-who-smelt-it-dealt-it guys." And so I met Collins one day in UIC's basketball offices, and he was more than happy to spend an hour answering some questions about Pearl. Collins, it turned out, was holding a lot more than just a grudge. He told me he still had reams of transcripts of NCAA testimony related to the Thomas affair, and then he issued a warning. In the wake of Pearl's firing, it's worth revisiting that seminal moment in his career, the Deon Thomas recruiting saga, from which we've obtained a number of little-seen and revealing documents. It may not have been the most important sports scandal in recent memory. Given what's happened at Tennessee, it may not have even been the most important sports scandal to involve Pearl. But it was a model scandal. It had all the elements. It was Cam Newton and Renardo Sidney and O.J. Mayo and Blue Chips, all rolled into one and topped off with a touch of Nixonian spycraft. No one came off well: not Pearl, who'd broken a kind of coaching omerta; not Collins, who was labeled a cheat at a time when Illinois's rivals around the Midwest were trying to lay recruiting inroads in Chicago; not Thomas, who looked like another kid with his hand out; not Thomas's supposed best friend, who acted as Pearl's snoop; not Mike Slive, who was then a lawyer hired (and subsequently fired) by Illinois and who is now SEC commissioner; not Randy Rueckert, a former NCAA investigator, who once allegedly hounded Deon Thomas up and down the sidelines of a pickup game; not Rich Hilliard, the former head of the NCAA's enforcement staff, who was a college friend of Pearl's and who would have some trouble of his own staying on the right side of the rules. Even two decades on, it still has something to teach us — about Pearl, yes, but especially about the nature of that burn-proof vault of yellowing secrets known as the NCAA. "While I was playing I really tried to not give it much thought," said Thomas, who played four years at Illinois and then spent most of his 14-year professional career abroad. He is now the men's basketball coach and athletic director at Lewis and Clark Community College in southwestern Illinois. "My grandmother said, 'Don't think about the past because you can't change it.' And you will often hear me quote her, because my grandmother, and my mother were the biggest influences on me. My grandmother was the reason I didn't go to Iowa — which the NCAA didn't want to hear. But I guess maybe they didn't believe the poor black kid knew money wasn't the be-all and end-all." What's striking and especially telling about the letter is the stuff that didn't raise Berst's eyebrow — Pearl tracking a recruit all the way to Amsterdam, one of seven trips involving the recruitment of Thomas that cost Iowa more than $10,000 in all, according to one account; Pearl enlisting a kid as a mole and dangling a scholarship in front of him; Pearl creepily recording phone conversations with Thomas; and so on— and the stuff that did, like whether or not Thomas received a $100 jogging suit. According to his statement, Anderson looked over and saw two similarly dressed men — both wearing polo shirts and blue slacks — watching Deon as he made his way up and down the court. Suddenly, one of the two men, later identified as Rueckert, began walking up and down the sidelines yelling at Deon while he was playing. Just as suddenly, Deon quit in the middle of the game and walked away. The two men followed. So did Anderson. Collins calls Slive a snake who tried to "force-feed me words." He has long maintained — without evidence — that Slive was part of Pearl's conspiracy against him. And this fall he thought he saw the old alliance at work once again. While suspending Pearl for eight conference games, Slive lent verbal support to the embattled coach. "In the analysis I determined there may well have been enough for the entire conference season," Slive said in November, "but the fact that he owned up to what he had done, owned up to the underlying violations, I felt half of the conference season was an appropriate matter." For his part, Pearl responded much as he did at Iowa, wrapping himself in virtue. In January, when asked by ESPN's Jimmy Dykes what he had learned through this latest ordeal, Pearl said: "That my faith in God has never been stronger and that my faith in man has never been weaker — including myself." Kyles's role in the story is one of its uglier elements — a high school kid being urged to rat on his peer, all so that one basketball program might gain leverage over another one — and even today it's unclear who was conning whom harder, Pearl (with his talk of a scholarship for Kyles) or Kyles (with the suggestion that he was part of Thomas's inner circle). Thomas recalls Kyles as a chubby, unpopular kid whom his group of friends had taken in. Pearl, however, thought Kyles was Thomas's closest pal. Pearl and Kyles communicated frequently throughout the recruiting process. Kyles, according to transcripts of telephone conversations, had told Pearl that Collins was offering tens of thousands of dollars to lure Thomas to Illinois. An investigator hired by Thomas's attorney later interviewed Kyles, and, according to the investigator's report to the NCAA, Kyles claimed he never heard Thomas tell him about the $80,000 or the Blazer — contrary to Pearl's claims. However, the investigator said that when he had asked Kyles to sign a statement avowing this, his father stepped in and wouldn't allow it. In his official response to the NCAA, Thomas called Kyles "a shakedown artist." As the judge's right-hand man, his job was not inconsistent with his future duties as a college recruiter — find kids and bring them in — and in this weird way he grew to know the high-school scene in Chicago. In 1983, Lou Henson hired him as an assistant at Illinois, and Collins was his Chicago bird dog, bringing in the likes of Nick Anderson, Lowell Hamilton, and the ill-starred Ben Wilson. Collins, who took the head job at UIC in 1996, had a career enough for two, but when he left the Flames after 14 seasons, he departed with the nettling thought that he had failed to reach his true coaching potential for reasons beyond his control. He told me that in 1988, the season before the NCAA's dogs were unleashed upon him, he met with Tennessee to discuss the head coaching position there. The job ultimately went to Wade Houston, father of former New York Knick Allan, but Collins was sure he soon would've landed a commensurate job had it not been for Pearl, whose rise in the hoops world — until very recently — only salted the wound. "In Champaign, all the people down there know it didn't happen," Collins said. "But the further I get away from Champaign, I get people saying, 'Ah man, how you doing? It's so good to see you beat that case.' I [worked in] the probation department for seven years and when you beat the case, it means they didn't have something on you to prove that you did it — but you did it and you got away with it." The mistake people have often made in analyzing the Deon Thomas affair is in seeing it as a matter of perfect guilt and innocence — as if such a thing were possible. 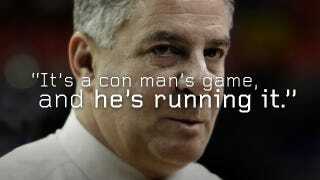 If this particular scandal has anything to teach us now, it's that just because there are horns in college basketball doesn't mean there are also halos — a proposition to keep in mind these next few weeks, as the recent hagiography of Bruce Pearl is fully dismantled. After all, the whole enterprise of big-time college sports rests on maintaining the lie that it's not an enterprise at all, and what we get as a result is an unending series of petty frauds, all of them tiny subsidiaries of that Big Fraud, the ultimate burn-proof vault. Pearl's crime at Iowa was insisting too ostentatiously on the rule of law in a lawless land. His crime at Tennessee was winking too conspicuously at same. Somewhere in between is where the Big Fraud is most comfortably sold.